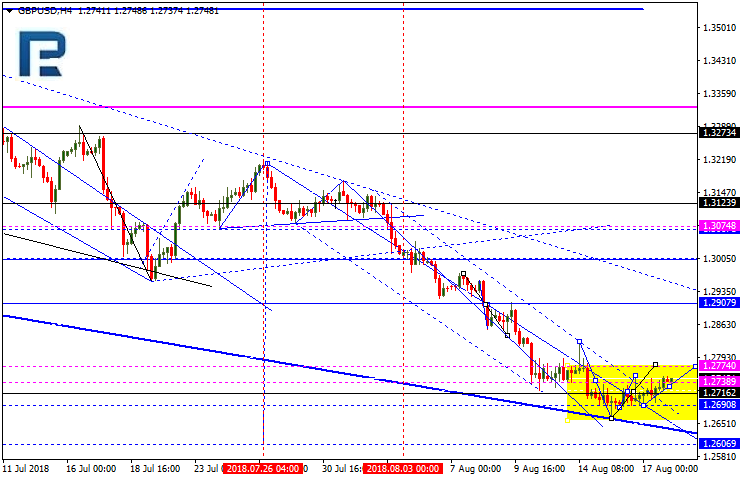 EURUSD is still being corrected. 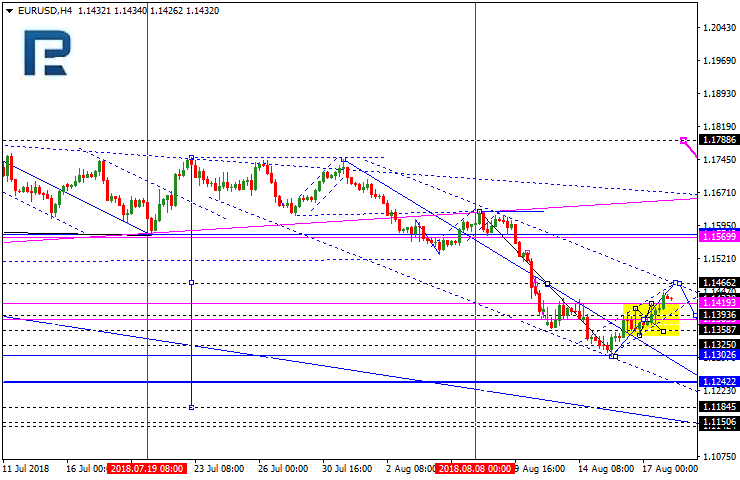 Today, the price may grow to reach 1.1466 and then fall towards 1.1390, thus forming another consolidation range. If later the instrument breaks this range to the downside, the price may continue falling to reach the target at 1.1185; if to the upside – continue the correction towards 1.1566. 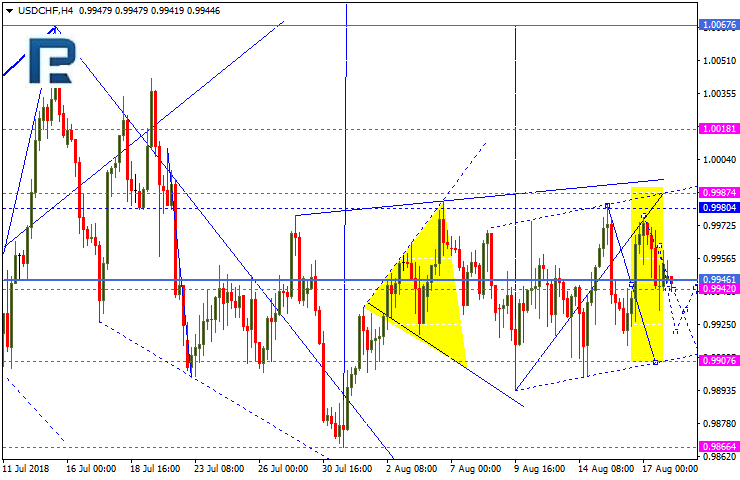 GBPUSD is moving upwards. Possibly, the pair may be corrected to reach 1.2774 and then fall towards 1.2716, thus forming another consolidation range. If later the instrument breaks this range to the upside, the price may trade to reach 1.2900 (an alternative scenario); if to the downside – continue falling inside the downtrend with the target at 1.2600. USDCHF is still falling; it has already reached its closest downside target and right now is forming the fourth structure. Possibly, today the pair may extend this structure towards 0.9907. Later, the market may start another growth to reach 0.9988 and then fall towards 0.9942, thus forming another consolidation range. After that, the instrument may break the range to the upside and continue growing with the target at 1.0066. 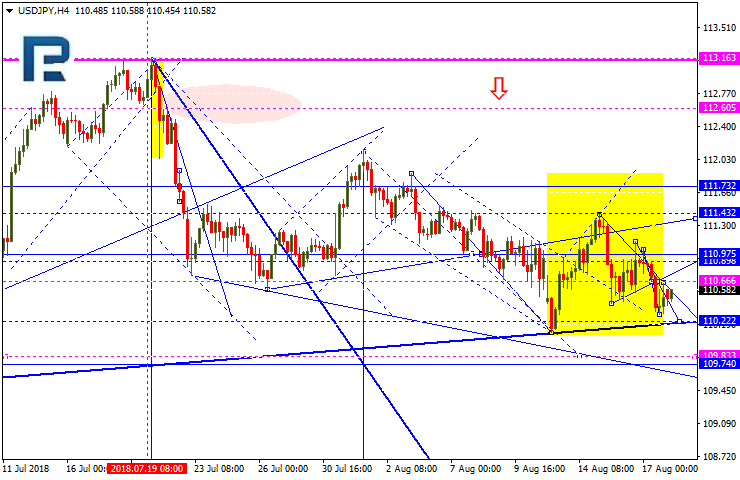 USDJPY is still consolidating. 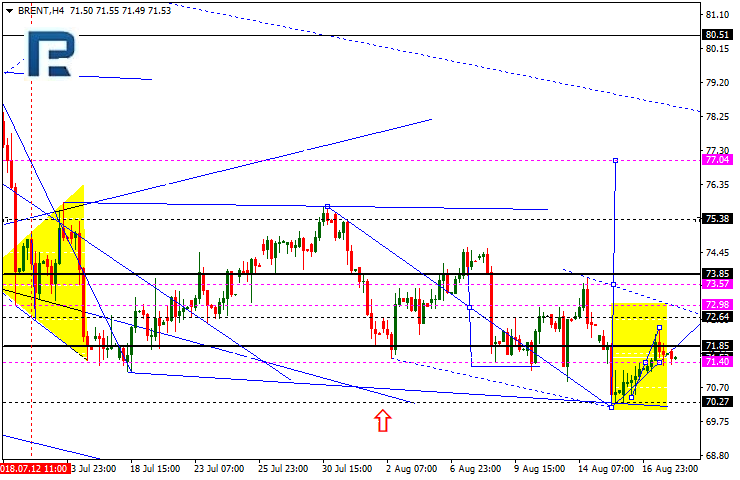 Today, the price may fall towards 110.22 and then grow to reach 110.88. An alternative scenario implies that the pair may extend this structure towards 111.66 and then resume trading downwards. The target is at 109.90. And that’s just a half of this descending wave. The short-term target of the third wave is at 107.40. 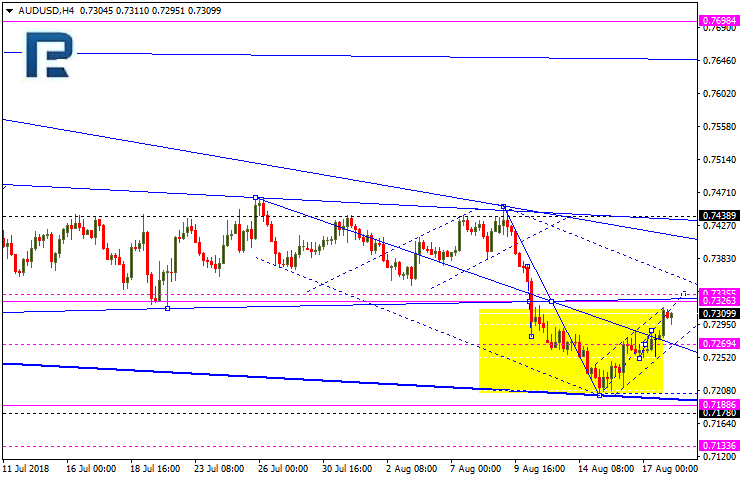 AUDUSD is still being corrected. 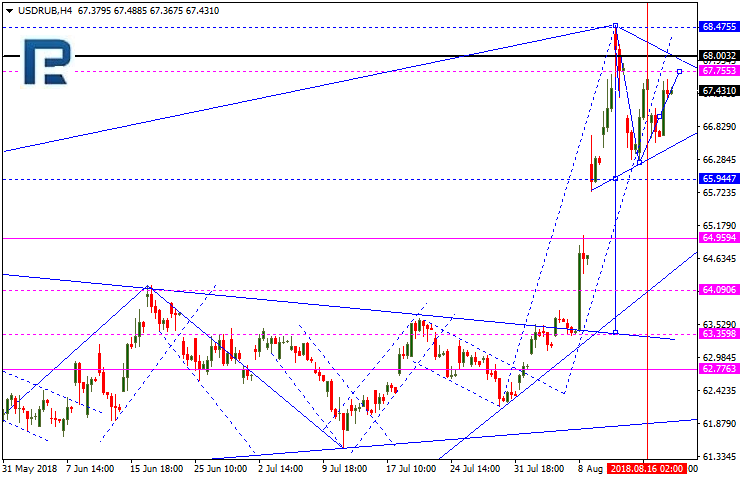 Possibly, the pair may reach 0.7333 and then fall towards 0.7270, thus forming another consolidation range. If later the instrument breaks this range to the upside, the price may continue the correction to reach 0.7440 (an alternative scenario); if to the downside – resume falling inside the downtrend with the target at 0.7188. USDRUB is forming a new ascending structure with the target at 67.77, thus forming another consolidation range at the top. If later the instrument breaks this range to the downside, the price may start forming the third descending wave with the target at 64.09. Gold has broken the descending channel and the top of the first ascending impulse, and may start another correction towards 1212.00. 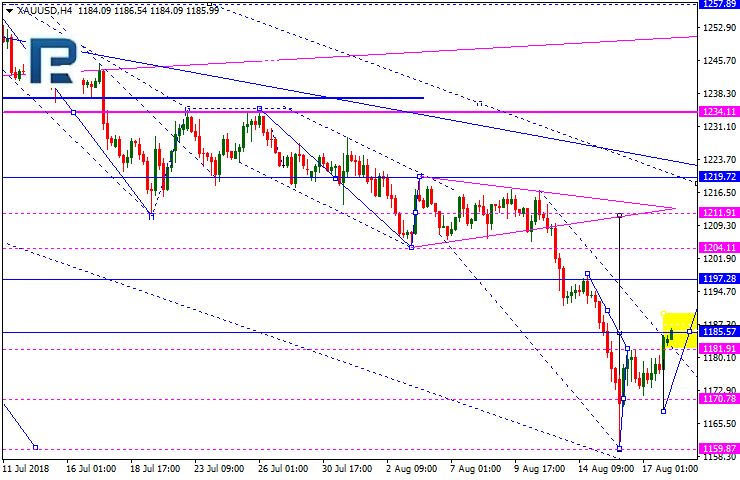 Today, the price may reach 1204.00 and then fall towards 1186.00. After that, the instrument may resume growing with the first target at 1212.00. Brent is moving upwards. Possibly, today the pair may reach 72.65 and then fall towards 71.40, thus forming another consolidation range. According to the main scenario, the market is expected to break the range to the upside and then continue growing with the short-term target at 75.50.